We’re ready for 2019’s event and excited to share that it’s going to be on June 14th! That’s right, it’s going to be a Friday evening event. Registration details will be available soon. But for now, mark your calendars – Friday June 14th – Run for Recognition 5K + 1 Mile Fun Run. Run for Recognition 5K Highlights 2018 from MTM Recognition on Vimeo. Thank you to all who came out and joined us at this year’s Run for Recognition! Here are the 2018 Run for Recognition Results. We will be posting pictures later this week for all to see. Author Ashley HurneyPosted on June 25, 2018 Categories UncategorizedLeave a comment on 2018 Race Results! It’s the week of the race! We can’t wait to see everyone at this year’s event. Packets will be available for pickup on Friday, June 22nd from 12:00-6:00pm CST at the OK Runner OKC location. Packet pickup will close promptly at 6:00pm. You may also pick up your pack the morning of the race from 7:00 am – 7:45 am CST at the OK Runner OKC location. 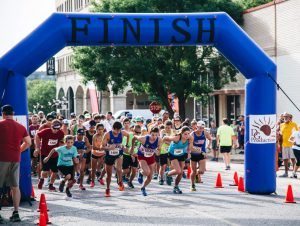 Author Ashley HurneyPosted on June 18, 2018 June 20, 2018 Categories Uncategorized1 Comment on Packet Pick Up! Registration for the 2018 Run for Recognition is now open! Be sure to register before June 15th to ensure your t-shirt size. The event is June 23rd and will be held at the OK Runner OKC location. Author Ashley HurneyPosted on May 16, 2018 Categories UncategorizedLeave a comment on Registration Now Open! Race times from DG Productions are posted here. View photos from the race here. We’re Excited for 2017’s Race! Author Ashley HurneyPosted on May 10, 2017 March 27, 2018 Categories Race NewsLeave a comment on We’re Excited for 2017’s Race!